In 1977, the 39-year-old governor of California led a puzzled press corps to a blustery stretch of coastline near Bodega Bay. “I heard that you were going to come out here and talk to the whales,” one reporter said to him. Whale calls could be heard in the background, played by the “Gray Whale Listening Station,” an experimental project by the California-based art and architecture collective known as the Ant Farm. 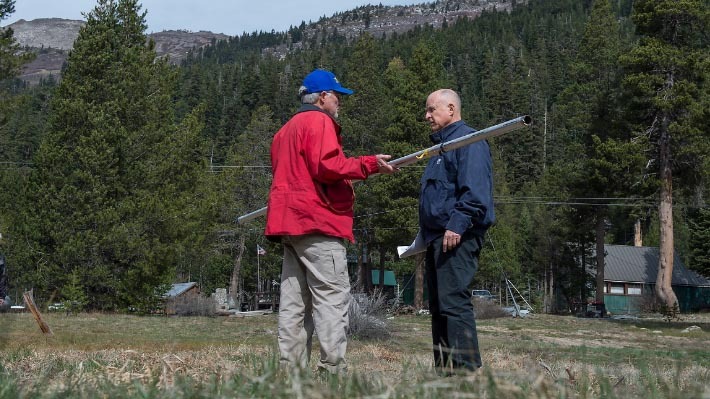 It was his first tour as governor, and Brown talked about environmentalism long before it was mainstream, promoting the nascent technologies of solar and wind power. At the time, critics thought his ideas were on the fringe. That approach earned him the nickname "Governor Moonbeam." Now, more than 40 years later, Brown is leaving office again, having passed some of the most ambitious climate change policies in the country. Under his watch, renewable energy has boomed and carbon emissions have declined. Still, some say Brown didn’t go far enough, leaving California with the toughest climate challenges to come. Brown sees it both ways. Alex recalls an out-of-office message he put on his email a few years ago. “My response said, ‘I’m unplugging, no email, no nothing,' and he wrote back and he said ‘Why? This is the time to be engaged. What are you doing?’” Alex remembers. So, as Brown’s tenure ends, here are his biggest climate accomplishments (and what his critics had to say about them). Three years ago, Brown set an ambitious target for cutting greenhouse gas emissions in the state. He ordered a 40 percent reduction below 1990 levels by 2030. But in September, he upped the ante, signing another order that would make the state carbon neutral by 2045, then achieving negative emissions after that. It means California wouldn’t be creating a net increase in greenhouse gas emissions. What will that actually look like? No one really knows. As an executive order, the policy is more like a rough guideline. New laws or rules from state agencies would be needed for it to actually go into effect, usually after lengthy scoping processes. And a new governor could simply undo the order (though Governor-Elect Gavin Newsom has been largely supportive of Brown's climate policies). In practice, being carbon neutral wouldn’t require California to end all carbon emissions in the state. The state could offset any remaining emissions by finding ways to pull carbon out of the atmosphere. That includes storage in natural ecosystems by building up the soil or by capturing it from manmade sources and putting it deep underground, a technology that California has struggled to get off the ground, despite millions of dollars of investment. Car-loving Californians are potentially the state’s biggest hurdle to reaching its climate goals. Transportation is the largest source of greenhouse gas emissions in the state. Last January, Brown set a goal to put 5 million plug-in and electric cars on the roads by 2030. It's no small feat, considering there are now only 500,000 on the roads in California. The state has been handing out rebates, carpool-lane privileges and other incentives to try to entice drivers to switch. Still, some environmental groups thought Brown should tackle the problem at the source by banning oil production. California is the fourth-largest oil producer in the country. Brown shrugged off the “leave it in the ground” critics by pointing out that oil production is already declining in California. In 2017, the future of one of California's core climate policies was cloudy. The state's cap-and-trade program faced a life-or-death vote in the state legislature. Few climate policies have been as controversial in the state as cap and trade. Critics blame it for everything from a rise in gas prices to providing funding for the much maligned high-speed rail project. Under the system, power plants and industrial and manufacturing facilities either must cut their emissions or buy carbon credits from someone else who has cut their emissions. Since it was only mandated through 2020, Brown and others wanted to see it extended to 2030. But saving cap and trade would require winning over a tough audience for Brown: Republicans. Mayes says he and other Republicans had seats in Brown’s office, where details and compromises were hammered out. Some of those compromises even won over the oil industry, which dropped its opposition to extending cap and trade. In the end, Brown and his executive team helped win eight GOP votes. Those legislators faced political backlash from other Republicans. Some environmental groups thought Brown’s compromises had gone too far. “He essentially gave away opportunities to get more local pollution reductions from oil refineries--reductions that can protect public health--in exchange for the industry's support for the cap-and-trade extension,” said Kathryn Phillips, director of Sierra Club California. 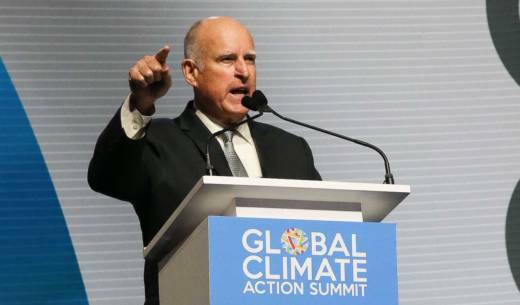 Left-leaning California has tangled with Republican presidents before, but Brown hasn't minced words about President Trump or climate deniers, whom he deemed "troglodytes." The battle came to a head when the Trump Administration sought to revoke California’s long-standing power to set its own clean air rules. It dates back to when the Clean Air Act was signed in 1970. California was given special permission, known as a “waiver,” to put stricter limits on pollution coming from tailpipes because the state was facing a severe smog problem at the time. For many years, that meant automakers had two sets of standards to meet when making cars: the federal fuel economy rules and then California’s tailpipe emissions rules. Twelve other states and Washington D.C. have also signed onto California's rules. Then, under the Obama Administration, California and the federal government agreed on one uniform set of rules. The Trump Administration sought to undo that, announcing its own proposal for fuel economy rules, freezing them for cars and trucks from 2021-26 instead of gradually allowing them to get tougher every year. The administration also announced it would seek to revoke California's waiver, something that had never been tried. It was just one of many stops he made on a worldwide climate change tour. Even under Gov. Arnold Schwarzenegger, who helped pass the state’s first major climate law, AB 32, California has seen itself as a leader on the international stage. But Brown created a new partnerships. In 2015, he banded together with leaders from states, provinces and cities around the world to announce new commitments to cut carbon emissions. The partnership was called “Under 2 MOU,” with the goal to keep global average temperatures from rising more than 2 degrees Celsius, which scientists say could avoid the most catastrophic effects of climate change. Today, 220 governments have signed on, though the agreement to cut emissions is not binding. It culminated in September, when international leaders gathered in San Francisco for a climate summit. Brown announced California would launch its "own damn satellite" to track carbon emissions globally. His movement became higher-profile after the Trump administration announced it would pull the U.S. out of the Paris climate treaty. 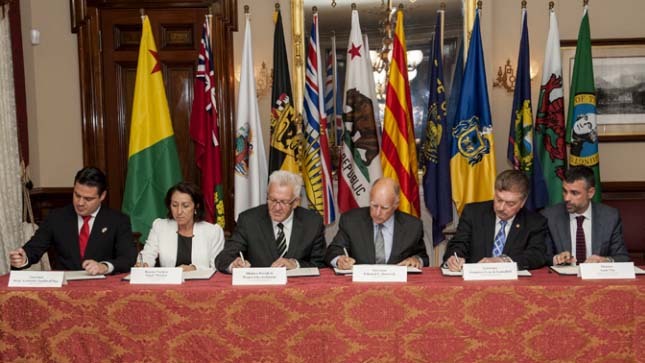 Brown told international leaders that California would fill the leadership void. Otherwise, he’ll be tending to olive trees on his Northern California ranch.